Last year we trained over 120 of our girls’ mothers in improved agricultural techniques and table banking, to help them become food secure, increase their income and better manage their finances. As a result, for the first time, these women have sufficient funds to be able to contribute to their daughters’ school fees and better support their families. Thanks to the incredible efforts of the women that we trained, all of the girls in our Success for Girls in School and Aspire Scholarships programmes, who passed their primary schools exams, are now in high school with only a small financial contribution from Team Kenya! We are so proud of them all and so grateful for the continued support that has made this possible. More good news – We have moved! Many of you will remember seeing photos of our students studying in the gardens of Karibuni Eco Cottages. 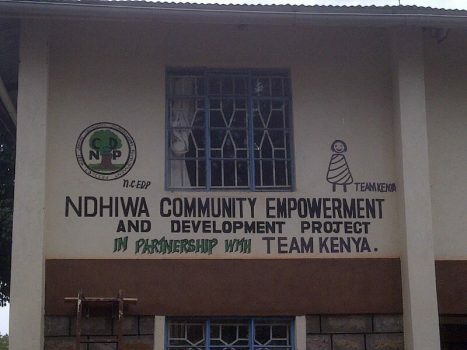 Thanks to your support and contributions from grant funding, our partner organisation, NCEDP, have now moved into a brand new office in the centre of Ndhiwa, where they have a library, ICT centre, learning spaces and a meeting room. Our Form 1 girls have been settling into their new secondary schools, we have nine girls who started Secondary school in January. Zuleah Awino is very appreciative of the support she is receiving. She is finding her solar lamp really useful in enabling night-time study. Cynthia “My name is Cynthia I am 15 years and this year I have been privileged to join form one at Ojode Pala Secondary. I am a total orphan, my mother died in the year 2001 and my father in the year 2005. My mother died after giving birth to me therefore I was not able to enjoy any parental care from her. This year we have just three girls in Form 4: – Hanny Daphrose at Ratanga, Ochine Achieng at Nyamago and Pamela Akoth at Pala. They will sit their KCSE exams in November. All three are working well and will be given extra tuition where needed. Hanny writes about her school motto, “Knowledge Empowers” which she finds inspirational. She also explains how she helps her best friends in languages and they help her with maths which, she feels, is her weakest subject. They must be helping as she achieved C+ in a recent test! Term 1 Results -There have been some outstanding results achieved by some of the girls with Loice Odero and Joan Mercy form 2 consistently achieving A grades. Form 4 students are always graded very low in their final year as its believed it wll motivate them to work harder so we are still expecting good grades later this year in the final exams. The students who are struggling will be given additional help, encouragement and resources where needed alongside guidance and counseling. Last year’s Form 4s received their KCSE results in January. Countrywide the results were lower than in previous years because of changes to the marking system, nevertheless all our students passed and our highest marks were achieved by Valarie Adhiambo, who is about to begin her university career. Valarie went to a local state day school and was on a full scholarship from Team Kenya. Because of her excellent results, Valarie will gain direct entry to the university of her choice later in 2017, meaning she will get reduced fees and a student loan from the Kenyan Government. Saida Atieno, the daughter of one of our longest standing members of staff, Millicent, achieved a grade C, placing her alongside Valerie in the top 20% of students nationally. Several of our students have had a difficult term as lecturers and doctors have been on strike. Beryl Odialo and Esline Owili have been helping in the Brighter Futures (one of our new projects) office part time whilst they wait for classes to resume. Sam, Samwel & Rosemary are now football coaches and peer mentors at NCEDP. Samwel is hoping to go to college to study nursing later this year. Thank you for your incredible support that has made this possible!